The 7th Annual Women in Music Festival – Directed by SBAI Faculty Associate Sylvie Beaudette – begins today! This year, the Eastman School of Music is proud to welcome Hilary Tann as their Guest Composer for the 2011 WMF. 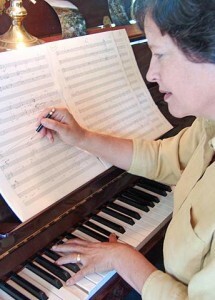 The Women in Music Festival is proud to welcome Hilary Tann as its guest composer for 2011. Ms. Tann will be in Rochester for a four-day residency, March 20-23, 2011, which will include open rehearsals and coachings, school presentations, a Neilly series lecture, and a lecture-presentation at the Eastman School of Music. A concert of her music will be held on Monday, March 21 at 8 pm in Downtown Presbyterian Church (121 Fitzhugh Street North). The concert will feature chamber works including “Shakkei” featuring solo saxophonist Chien-Kwan Lin, as well as a large piece, Exultet Terra, for SATB choir and double reed quintet to be premiered by Madrigalia and Musica Spei. More WMF events may be found on the 2011 calendar. This entry was posted in UR Events and tagged #beaudette, #esm, #wmf. Bookmark the permalink.